One dose (0.1 ml) contains 50 micrograms of the semi-dry mass of BCG bacilli which corresponds to amount from 150 000 to 600 000 of live BCG bacilli (Bacillus Calmette-Guerin), the Brazilian Moreau substrain. 0.5 mg (from 1.5 mln to 6 mln) of live BCG bacilli (Bacillus Calmette-Guerin), the Brazilian Moreau substrain. Powder and solvent for suspension for intradermal injections. Before reconstitution powder in the ampoule or vial is dry amorphous white or light-cream coloured. BCG 10 Anti-Tuberculosis Vaccine is used for protective vaccinations against tuberculosis. Vaccinations are mandatory in Poland, carried out in accordance with the Immunization Program Annually approved by the Minister of Health. Catch-up (supplementary) vaccinations in subjects unvaccinated after birth should be performed as early as possible, no later than at 15 years of age. In case of BCG immunisation booster vaccine doses are not recommended. 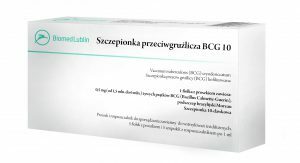 Solve BCG 10 Anti-Tuberculosis Vaccine in 1 ml of isotonic saline. After reconstitution a homogenous, uniform suspension without possible presence of flocs or precipitates is formed. Aspirate to the syringe only 1 vaccine dose of 0.1 ml for one child. Vaccination should be performed by personnel specially trained in the technique of intradermal injecting. The vaccine should be injected intradermally into the outer 1/3 upper part of the left arm. The injection must be made with a special tuberculin syringe with a well-fitted needle. Before vaccination, disinfect the skin in the site of administration with alcohol and allow it to dry. Grasp the skin with a thumb and a forefinger of one hand, and insert the needle obliquely to a depth of approximately 2 mm below the outer layer of the skin, almost collaterally to its surface. After administration of 0.1 ml of BCG Vaccine and upon the correct injection technique, an intradermal wheal of approx. 7 mm diameter should be formed. In accordance with the World Health Organisation recommendations, the BCG Vaccine should be injected in the region of the deltoid muscle of the left upper limb (in the middle part). Injection of the vaccine into higher region of the arm may lead to keloid formation. After 2–4 weeks, at the vaccination site in 90-95% of vaccinated individuals an infiltration forms, which remains for several weeks. Predominantly, at the top of the infiltration a pustule and subsequently an ulceration usually 2–5 mm in diameter, not exceeding 10 mm are formed. The lesion is self-healing during 2–3 months from the vaccination leaving a whitish scar several millimetres in diameter. In some persons, out of the pustule serous fluid may ooze for a longer period of time, which is not a complication and does not require treatment but keeping this area clean. Instructions on reconstitution of the medicinal product before administration, see section 6.6. •	persons who have suffered from tuberculosis or persons with large (over 5 mm) reaction to RT23. Prematurity as such does not constitute a contraindication to vaccination, vaccination is recommended to be performed in this group of patients after weight gain up to 2000 g.
BCG 10 Anti-Tuberculosis Vaccine should only be administered intradermally. The potential risk of apnoea and the need for respiratory monitoring for 48–72 h should be considered when administering the vaccine to very premature infants (born ≤ 28 weeks of gestation) and it particularly concerns children with previous history of respiratory immaturity. Due to considerable benefits arising from vaccination of that group of infants, vaccination should not be withheld or delayed. BGC vaccination should be postponed in the case of newborns whose mothers have been exposed to anti-TNF therapy during pregnancy or other potentially immunosuppressive IgG1 antibodies. A doctor will determine a vaccination date. Intradermal BCG vaccination may be performed concurrently with inactivated or attenuated vaccines. Vaccines containing live microorganisms will not be given at the same time as BCG Vaccine, an interval of not less than four weeks should be allowed to lapse between vaccinations. BCG vaccination should be postponed for four weeks if other live vaccine has been injected. The time interval between vaccine containing live microorganisms and vaccine not containing live microorganisms is optional, maintaining the required interval in order to avoid possible superimposition of side postvaccinal effects to consecutive vaccination. Other vaccines given at the same time should not be injected in the left arm restricted for the BCG vaccine. A child should not be vaccinated in the left arm at least for 3 months after administration of BCG due to the risk of regional lymph nodes inflammation. Breastfeeding is not a contraindication to BCG vaccination. BCG 10 Anti-Tuberculosis Vaccine has no nor has negligible influence on the ability to drive and use machines. Like all medicines, BCG 10 Anti-Tuberculosis Vaccine may cause side effects. Lesion at the injection site: infiltration, pustule, ulcerations sometimes with serous fluid drainage usually resolve spontaneously within 3 months from vaccination and does not need treatment. Enlargement of regional lymph nodes, most commonly axillary up to 15 mm in the vaccinated person is considered as an expected normal post-vaccinal reaction. are most commonly connected with a mistake in the vaccine administration technique, incorrect dosage or individual reaction (e.g. positive result of RT23 test). If following BCG vaccination local reaction occurs within 24-48 hours and abscess (within 5-7 days), one can suspect previous tuberculosis infection. Injection of the vaccine too high, in the upper region of the deltoid muscle increases risk of keloid occurrence. In case of serious local reactions or regional lymph nodes inflammation, medical consultation is required, then an individual decision is made how to proceed, but most commonly no treatment is performed because reactions resolve spontaneously. Serious systemic reactions following BCG vaccine administration are very rare (approx. 2/1,000,000), and in general affect people with impaired immunity. Disseminated BCG infection requires expert advice, bacteriological and immune system diagnostics and antimycobacterial treatment in a hospital setting only. In the case of post vaccination changes occurrence, which according to paediatrician meet criteria of post vaccination complications, a child should be referred to a consultant who will make the final diagnosis and recommend further action. Apnoea in very immature preterm infants (born ≤ 28 week of pregnancy- see point 4.4). The table below was prepared in accordance with the MedDRA System Organ Classes classification (System Organ Classes and recommended terminology).